I love when friends and readers of MKC send me recipes! It’s always fantastic to read about what other people are eating and loving, plus I have this weird hobby that consists of things like reading recipes, looking for recipes, begging for recipes. I love me some new recipes. A total no-brainer in the preparation department, a myriad of delicious, fragrant spices are added to chicken broth and poured over a pork roast or pork chops. 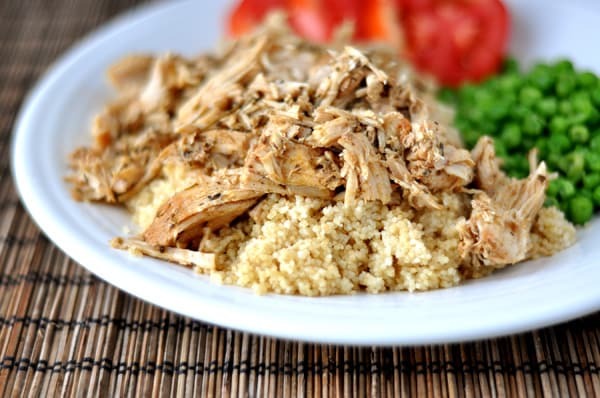 Slow cooked to tender perfection, the shredded pork and lingering, tasty juices are served over couscous. Serve with sliced tomatoes and a steamed veggie and you have a complete meal. Healthy, incredibly flavorful, and simple beyond words, this is a perfect solution to a frazzled weeknight dinner conundrum or even for a lazy Sunday afternoon when you don’t want to be slaving in the kitchen. In a liquid measuring cup combine the oil, broth and spices. Cut small slits with a paring knife into the pork roast (or pork chops). Place the pork in a 4-quart slow cooker and pour the broth/spice mixture over the top of the pork. Cover the slow cooker and cook on low for 7-8 hours until the pork is tender. Remove the pork from the slow cooker and shred into pieces. Return the shredded pork to the slow cooker and toss with the juices/liquid. Serve the meat/juices over couscous. Absolutely delicious! Big hit for my family even for my picky eaters! Made this in the Instant Pot tonight. I cut the pork loin into ~1 inch slices, placed pork in Instant Pot and dumped the broth/spice mixture over the top. Mixed it a bit, pressure cook for 20 minutes with 10 minute natural release. It was so juicy and delicious. Mel, everyone thinks we’re real life friends because of the way I talk about you, but seriously, you’re awesome. I make this a couple times a month – a favorite of mine! 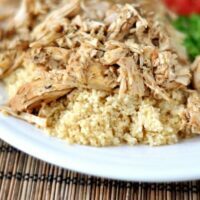 I love putting the pork over cauliflower rice – healthy, easy, and very flavorful! Really great recipe as usual! I added a teaspoon of salt & some pepper, used some smoked paprika. Served with mashed potatoes & some oven roasted veggies. I have a feeling some of the folks giving negative reviews may be using pork tenderloin instead of loin. NOT the same thing. I only cooked the pork on low in the crockpot for six to seven hours and it was completely dry like another poster here. No broth left! I enjoyed the flavor and the concept and the kids still liked it, but next time I’ll double or triple the liquid components. Luckily, the pork was tender and moist, so I know I didn’t overcook it. We love everything from your site – but this wasn’t really a hit in our house. We didn’t think it had much flavor. I followed the directions exactly. We didn’t love this one the first time around. I used a 2.5 # roast on low for 8 hours and it was dry. I also used low-sodium chicken broth and missed the salt in the end result. Next time I’ll go closer to 7 hours and add some more regular chicken broth. I love how easy it is so I’m not giving up! Tried this last night. The whole family loved it! We served ours with tri-color couscous and asparagus. Thanks for the recipe; it’s definitely a keeper! This dish was so good! I served it over Jasmine rice which rounded the flavors out nicely! Hey Mel, I noticed there is no salt in the ingredient list. Did you find that you needed to add any, or was the chicken broth salty enough? I made this and loved it, but I used my homemade chicken broth (no salt in it) and so rubbed the pork with salt before putting it in the crockpot. It was AMAZING and we loved it, but was curious on the salt question. Hi Megan – the pork has been plenty salty with the chicken broth I use but that is a good point about perhaps adding it to taste if you use a lower-sodium chicken broth or homemade chicken broth. Thanks for the heads up! Used chicken instead of pork last night. Was pretty darn good, but I needed a whole can of broth (just shy of 2c) and a bit extra of the spices. Had it over quinoa cooked with broth and topped it with Parmesan. Really healthy, filling, and yummy. My husband loved this. The flavor was great and made in a slow cooker… it doesn’t get any better. Thank you for sharing!! This was really good! Loved it with the cous cous! Thanks! Here we go… Another MKC recipe that hits my inbox and is in the crockpot less than 12 hours later. Mel to the rescue again! Now my house smells great and we just may find ourselves eating this for breakfast. Thanks Clarissa and Mel! I have a pork roast in the freezer that I have been deciding what to do with. I think this will be perfect! So we were having dinner at a friend’s house the other night, and she was telling me that she just found another cooking blog that she loves. She is nursing right now, and says that she hopes every time she sits down that you’ve posted something because she loves loves loves your site. She loves your writing, your recipes… and she even said she was pretty sure you’d be friends if she really knew you. Anyway, it was really cute. I thought you would like to know. 🙂 I agree with her in all ways, of course. I’m so happy you liked it and am excited to see it here! I can’t wait to try your version because I’ve been looking for way to cut down on the oil without drying out the pork. 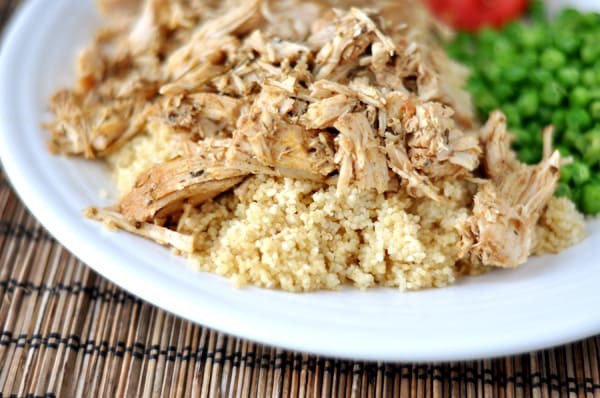 I love my slow cooker and we absolutely love couscous. I can’t wait to try this sometime! This looks delish but I’m not a fan of pork … Has anyone tried with chicken? Thanks! Liann – I haven’t tried it with chicken. If anyone attempts, let me know how it turns out! I really need to hop on the couscous train. This looks wonderful. I am also always looking for amazing new recipes, which is why I can’t start my morning without stopping by MKC! 🙂 This looks so delicious, Mel, and I love that is is a slow-cooker recipe!